I know, because that’s exactly what happened one night this week. Thankfully, Marley was just mastering a technique I call the ‘fake choke’. The one where he thrusts his head right back, holds his breath and goes a deep shade of purple. He holds it in for a few seconds longer than is normal (just long enough for us to think there’s something very wrong) before he finally exhales and goes completely back to normal, in what is probably the meanest practical joke anyone has ever played on me. And my brother once filled a box of chocolates with stones to give me as a birthday gift. Fake choke aside, it’s actually been an excellent week. Firstly, our cat Bo seems to have accepted her new secondary role, and even joined in as we were giving Marley a bath. We’ve also had a lot of visitors, and it’s always so nice to see how happy people are to meet him. He’s been on his best behaviour too, sleeping pretty much all the way through any lunches or dinners we’ve had and never crying when anyone holds him. One set of visitors brought along their two year old boy, and we all went out for brunch at Mel’s before heading back to our place for coffee and cake. It turns out two year olds are a bit more difficult to handle than a newborn. After a couple of stones (and tantrums) had been thrown, the two year old was looking around our garden and spotted my tomato plant. Now, having never had a garden of our own before, I have been making the absolute most of it and attempting some home grown veg. The tomato plant (miles ahead of the jalapenos, rosemary, mint and basil) is the one success I am particularly proud of. So imagine my utter horror when the two year old approached, reached out, and picked off one good sized but unripe, green tomato and run away with it. I pretended not to be annoyed (inside I was crying) and actually felt a little bit bad for him when he got a severe ticking off for his theft and consequently burst in to tears. But he deserved it. Look at those teeth marks! Anyway, I was fully cheered up when Marley started cracking his first proper smiles recently. I had been told that some new fathers struggle to form an immediate bond with their newborns, and it can make you feel like a bit of a spare part at times….but then when they smile, it all feels worth it. Well, fortunately, Marley seems to have taken to me pretty well (he always seems to stop crying when I hold him, which I love) but even so, those first few smiles have still been totally heart-melting and we’re just so delighted to see him happy. I just hope that it’s his new giant gorilla ‘Abz’ making him smile, and not the fake choke prank. So Marley has started throwing up pretty much every time he is fed, which is nice. The moslin cloth over the shoulder is now pretty much a firm fixture as our latest fashion accessory. He spends the majority of his time doing three things; clenching, coughing and crying. I don’t think sleeping even makes it in to the top five anymore. The three Cs are preventing him from getting comfy on his back most of the time, although he does settle down a little better when he’s squidged up on his front on my shoulder (he can’t do it so well on Catriona because he can smell the milk). The second you try and put him down in his crib though, even if he’s already asleep, he clenches up and starts making these high-pitched screeching noises that tell you he’s not up for that. 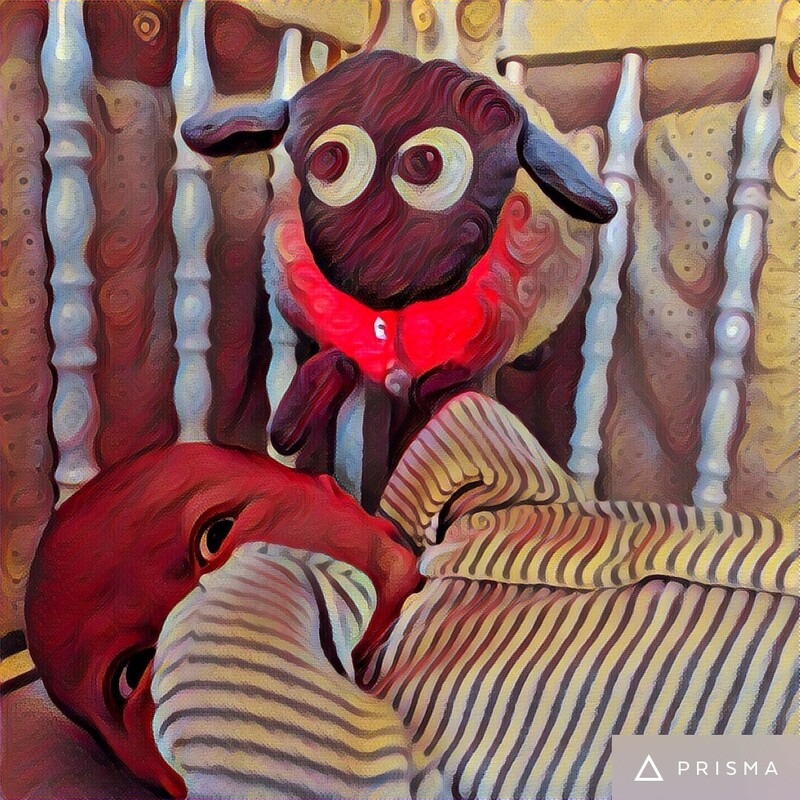 Anyway, Shaun the sheep is helping. He is basically Marley’s first cuddly toy that doubles up as a sleeping aid. Each of his feet has a button, and when you press it you get either white noise, a heartbeat or some other “calming” sound (the white noise coupled with the red glow it emits from its chest is frankly pretty terrifying). We had our first proper trip out with him recently, to the #bestbeergardeninlondon. The Leather Bottle pub is just down the road from us, and whenever we’ve been before, there have always been millions of kids running around and buggies everywhere. A nightmare prior to parenthood, but a godsend with a little one. A friend of ours had been working at Wimbledon, which is just down the road, so he came along for a pint in the huge beer garden with Marley, who was of course on his best behaviour. We also went out for our first meal with Marley on his one month anniversary, to Ben’s Canteen. Again, he was super well behaved and slept for the duration while we got stuck in to umami burgers and DIY donuts. The only problem with that is, when you get home at 11pm and you’ve got work the next day, and he has just slept for four straight hours…here’s pretty much no chance of you getting any sleep that night. Cue Shaun the Sheep for some “relaxation”…. For a couple of (thankfully) non-serious reasons, we stayed in hospital with Marley for two extra nights before returning home. He was fairly small (6lbs) and they wanted to make sure he was feeding properly, and they checked his blood-sugar levels just to make sure the gestational diabetes hadn’t had any lingering effects. (Gestational diabetes, for those who don’t know, is basically like Type 2 diabetes in the pregnant mother that lasts for the duration of her pregnancy, and then usually goes away as fast as it came – I had no idea it was a thing). I had left out a couple of days’ worth of cat food for Bo while we had been away, but even so, she was absolutely delighted to see me when I returned to check on her before taking the car back to collect Catriona and Marley. Once we were all back home, it only took a couple of hours before she started realising something was up. There are some awful stories about cats smothering new-born babies just by sitting on them. Some say the cats are just looking for somewhere warm to sit, but I must say I have my suspicions….either way, we weren’t going to risk it, so we locked Bo out of our bedroom from day one. There was some scratching on the door on that first night, but as Bo quickly but reluctantly accepted her place in the pecking order, it soon subsided. It is a bit sad that she seems to feel like we’ve replaced her….but then she is a cat, and that makes her a psychopath, so who knows what she is thinking half the time anyway. We settled in to our new routine faster than she did, and pretty soon we were changing Marley’s nappy in under a minute, burping him after feeding, and getting him down to sleep – at least during the day. There were a couple of funny moments in those two or three days of settling in; while I was changing him, a card was posted through our front door, and Catriona went to get it. It was from our neighbours (they’d obviously heard Marley before they’d seen him!) and as she read out the message while I changed him, I saw a spray of liquid shoot up and cover the card. Marley seemed to have aimed directly at it. And he knew. Go up the top and subscribe…….now!